SAF-T-CURETM UV FILTER SAFETY GLASSES 385 have a lightweight aviator design with hardcoated polycarbonate lenses. They provide 99.9% UV protection up to 385nm. A black metal frame and unique vinyl bridge design provide comfort without slipping. Made of 58 mm hardcoated polycarbonate lenses, and built-in sideshields, they offer excellent abrasion resistance. Their universal size keeps down inventory costs. 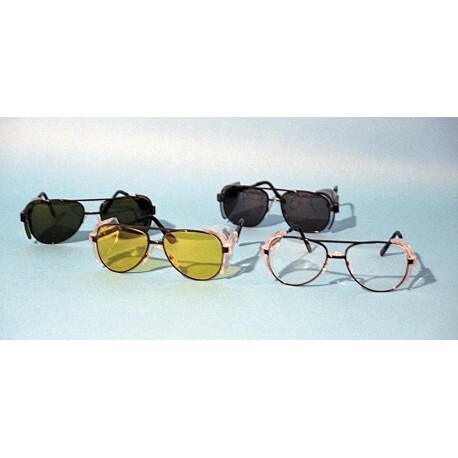 UV Filter Glasses #385 comply with OSHA requirements and ANSI Z87.1 standards. Available in 4 colors: Green for extra infrared protection, Gray for anti-glare, Amber for enhanced vision, Clear for maximum visibility. Sold individually or 24/case. Replacement lenses can be purchased separately.